up your front to ' safety ' [ your shoulder ]. 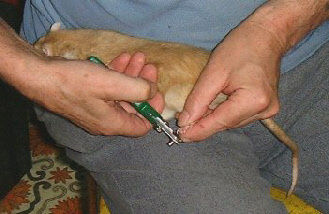 Do not grip a claw with the clippers because if he/she jerks suddenly the claw could be pulled out of the toe end, so set your aim, hold toe steady and clip the sharp tip off in one quick positive movement. Be sure to sit in good bright Sunlight if possible. 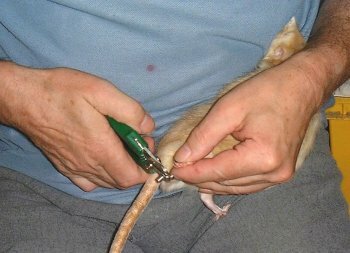 knee for the rat to be comfortable on. 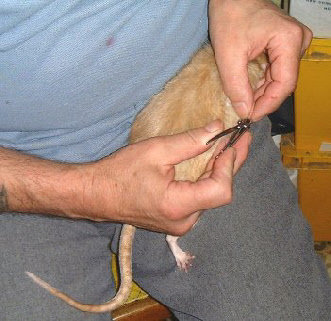 to struggle say against a wooly jumper front. 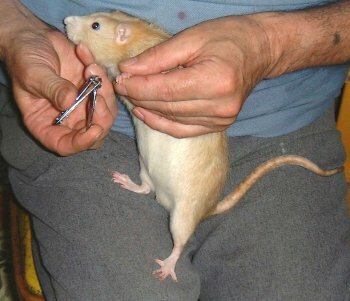 Not only essential for purposes of entering your rats in Shows but it also makes it less likely that the rat will cause ' self-inflicted' scratches on their backs and around their ears. The contents of this page are the Copyright of Colin Arundel and may not be re produced elsewhere in any media without my permission.